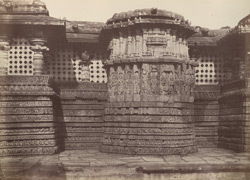 Photograph of the centre of the east front of the Hoysaleshwara Temple at Halebid in Karnataka, taken by William Henry Pigou in c. 1855, from 'Architecture in Dharwar and Mysore'. Halebid (ancient Dwarasamudra), a small town in the Hassan district, was once the capital of the Hoysala dynasty of the southern Deccan which flourished from the 12th to the 14th century. Invasions by armies of the Delhi Sultanate led to its decline by the mid-14th century. The Hoysalas were prolific temple builders and the site is renowned for the remnants of architecture and sculpture fashioned out of the chloritic schist in the region. The most famous monument here is the Hoysaleshwara temple dedicated to Shiva as Nataraja, the Cosmic Dancer, which was built for Ketamalla, an official of Vishnuvardhana (ruled c. 1108-42). It is an exemplar of the lavish Hoysala style and is encrusted with continuous bands of sculpture, unsurpassed in its detail and vibrancy. The temple, placed on a high platform, is twin-shrined or dvikuta, with each linked shrine preceded by a Nandi pavilion. Each of the twin temples has a sanctuary and an attached pillared mandapa or hall. The chlorite basement of the walls of the sanctuaries and mandapas is decorated with sculpture friezes and above them jalis or stone screens stand between columns turned on the lathe. The vertical projecting shrine in solid masonry, in the centre of the photograph, is decorated with sculptures of the gods set in the various projections.